Hi all: i have a few apps that trigger some odd "screen overlay" question and takes me to a selection page. i don't understand what this page does and why it's doing this annoying thing. may i ask if anyone else has experienced this please? What does the overlay say? What kind of selection? When does it pop up / what are you doing when it pops up? In addition to the information, a screen shot would be greatly helpful. In the meantime, don't click or go to external websites brought up by the pop up until toy now what it is. That drove me absolutely nuts! It finally worked itself out and has stopped. I have Twilight installed (Lux like App) so maybe that was causing it but I never had to disable it. on my S7 Edge, it was Appy Geek that consistently got that "screen overlay" screen to open up annoyingly and confusingly. other apps also did that but at this point, i can't remember. This is happening to me too - with instagram and a bunch of other apps. It says go to the screen overlay. I cannot use what'sapp or instagram with camera and it is driving me nuts........any advice? It would be a tremendous help if someone would define this a bit better than simply "screen overlay". What does it look like? What does it say? What happens when you tap on it? chanchan05, Bag of Leaves and 18_6 like this. This is happening to me when I try to change the alarm sound on my brand new lg g5 (just got it 2 days ago). I have screen shots but I don't know how to attach them here. I used Lux on my LG G4. I'm not using it anymore on the S7E, so I can't recall exact specifics, but there is an alternate overlay setting (maybe in Lux's Advanced Settings?) that if selected took care of any of the "screen overlay" issues related to that app. In the Quick Compose box where you reply, it is the icon that looks like a picture of a tree with a black line around it with black squares in the corners. It is to the left of the filmstrip icon. A box will pop up that will let you choose your photo and upload it. I have the Galaxy S7 and I see the popup as well. Its under settings and application manager. In the upper right corner you will see a "MORE" option. Select that and you will see Draw over other apps. This is the overlay that you are getting prompts from. Once you select it, you will see the option to Enable it or disable it. From here you can unselect it or, go to each app you are getting prompts for and see if it's enabled. If it's something you don't want to overlay other apps, simply disable it. If you don't like the overlay feature on any apps, you can select "disable" at the top of the list. Hope this helps. You don't mean the edge panel do you? So apparently, after playing with this for a couple of days, it appears that I have to disable Lux if I want to avoid this error message. Not helpful, since I really like Lux. After much frustration on my Galaxy S7 and searching everywhere... I figured it out. This was MY fix, at least. I went into "Display" settings, and unchecked "Keep screen turned off" and it was fine. So just another thing to try out for anyone who ends up here. Having the same message for various apps on one of the two s7 edges we have.. both run nova prime launcher.. not sure if its related or not.. the keep screen off was not on either.. in one case facebook, to get to gallery was causing this pop error.. i checked the draw ontop settings and facebook was enabled too.. rebooted and it was then ok, but then 12 hours later, more of the same.. this time just to click links in facebook messenger, same error. Or to save photos from webpages in chrome. I have the S7, regular not edge, & I have no 'Draw Over' option. This problem only occurred after yesterday's software update and it's very quickly driving me even more insane. What to do? I just fixed your exact problem on the exact same phone....step#1-first off do you have the clean master app or anything similar installed on your phone? If so, delete it. That app causes problems with the s7 because we already have a built in sweeper and security. Step#2- Once you've done that, power down your phone. While your phone is powered down, hold the volume up AND the menu buttons at the same time. While your holding both buttons, press and hold the power on button. (Now you should be holding 3 keys, volume up, menu, and power at same time. But remember, the volume up and menu should be pressed and held first, before pressing the power on button with them) as you do this, wait until you see either your phone carriers name/symbol or any display appear on screen that's showing your phone is being powered on. Once you see the display, let go of the power butyon, but keep the up volume and menu keys pressed, until it brings you to a screen that shows a couple options. Once your screen displays this, u may let go of all the keys you were holding....navigate down the options available with the volume down key and select on the option that says something about cache. (I don't remember all the other words next to this option, but I know it's the only option with cache in it, so bare with me. Lol) select that using the power key. A display with options yes or no will appear. Select yes. After this it should bring you back to the first screen with all the other options. Now select the first choice at the top that says reboot. ( don't worry, your data will not be lost). Then your problem should be fixed. Just go to the appsame that were giving up problems and give it permissions, aso you was trying to do before, but the screen overlay BS kept popping up, it won't anymore. BTW, I was looking thru all these forums and Google yesterday for a solution. It was driving me crazy. A t-mobile tech from Texas named Lewis is the one who helped me with my problem, about an hour ago. I never posted in these forums, but I had to make an account to let anyone else know, who has tried all other options and nothing works who ends up here. Because it was driving me [ language cleanup]crazy! So I hope this helps. Peace. nshalaby, captivedroid and AnnDroid like this. BTW, I was looking thru all these forums and Google yesterday for a solution. It was driving me crazy. A t-mobile tech from Texas named Lewis is the one who helped me with my problem, about an hour ago. I never posted in these forums, but I had to make an account to let anyone else know, who has tried all other options and nothing works who ends up here. Because it was driving me crazy! So I hope this helps. Peace. Everytime Android rolls out a new system update, I cringe bc it usually results in a major stress fest. Today's update was no different. I couldn't do ANYTHING wo the overlay popup. Followed your instructions and my S7 is back to functioning properly. When you say Menu button , do you mean the physical Home button in the bottom center ? I was getting the same message... It would say something like this... "Screen Overlay detected. 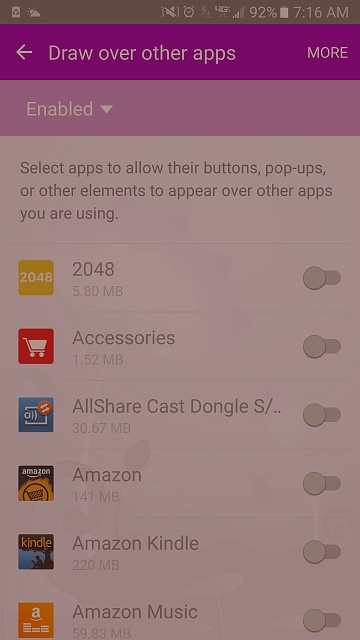 Go to app permissions to turn off." I tried different app permissions, but ultimately nothing was working. After a few minutes, the issue will work itself out, as it is mainly a problem with recently installed applications. This error is a result of the device not immediately asking if it is ok for the application to use certain things with in your device such as your gallery or contacts. That is all I have to offer as far as information. I hope it helps. Why can't I download Tpirbino off of Google Play to my Samsung Galaxy S3? Couldn't sign into my Google account when I set up my Samsung Tab S2. What do I do now? Is it possible to set up a Galaxy S5 with a data only plan in Alberta, Canada to make voip calls? How do I turn off simple sharing? How do I eliminate not sent messages that keep popping up?